MINOX-ve is an effective hair loss treatment system used in professional hair loss clinics to treat all generic male and female hair loss conditions. MINOX-ve has been formulated by a leading UK team of trichologists and hair loss product development specialists. 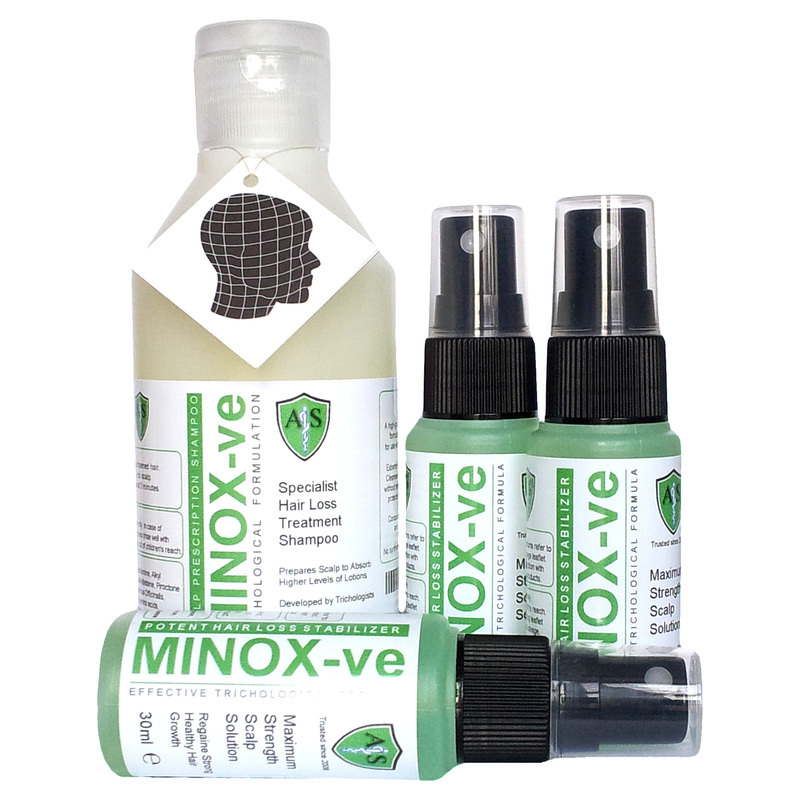 MINOX-ve is used throughout the UK and US by professional trichologists at specialist hair loss treatment clinics to treat their clients as it rapidly slows down hair loss and encourages an increased growth rate of healthy hair. MINOX-ve is now available for you to own and use at home - allowing you to avoid expensive and often prohibitive consultation fees charged by trichologists at hair and scalp clinics. Available only on Amazon UK and here on the official MINOX-ve website store. MINOX-ve EPG is a two part specialist hair loss treatment system for all male and female generic hair loss conditions. EPG brings together our winning clinical grade scalp stimulant hair loss product range with an industry leading home user's treatment programme. Never before has the self-diagnosing home user been so informed; the series of expert guides that come standard with MINOX-ve EPG have been written alongside professional trichologists with over 50 years clinical experience in treating every single hair loss condition imaginable. ...and we're giving it to you absolutely free. Every review and testimonial is linked back to verified purchases through our Amazon store so you can be certain they are 100% genuine. I'm male in my late 30's. On my fourth bottle of this product so all together I have been using it for just over three months. Received 4 days before the delivery date and i tried on the same day....so far i am loving it as after applying on the root and the scalp it really does give a really refreshing feeling and good smell. I've used the product only for about 5 days now, but there seems to be a tremendous improvement with my hair fall. I was pulling out whole chunks of hair last week. This week though, it has come down to around 5-8 separate strands every time I comb my hair. I hope it's as good at helping with regrowth as it is at abating hair fall. Will definitely buy again. I've been wanting to thicken my hair and increase it's growth rate for so long, my hair is naturally curly so takes a long time to grow and has thinned over time. With this product I've managed to enhance length whilst keeping volume. Great Product. Happy with result. Really reliable product. Am in my early thirties and have recently noticed the early onset of hair-loss. MINOX-ve has stabilised that initial loss and when combined with an hair loss shampoo improvement in hair strength is noticeable. Would recommend to anyone who is in early stages of MPB. I have used it for 9 days and it does..